The Camtech Z7 Router – Orca West’s Little Gem! Orca West Inc are a specialist signmaking company based in Edmonton in Alberta, Canada who have been serving the oil industry with quality signs and decals for almost two decades. 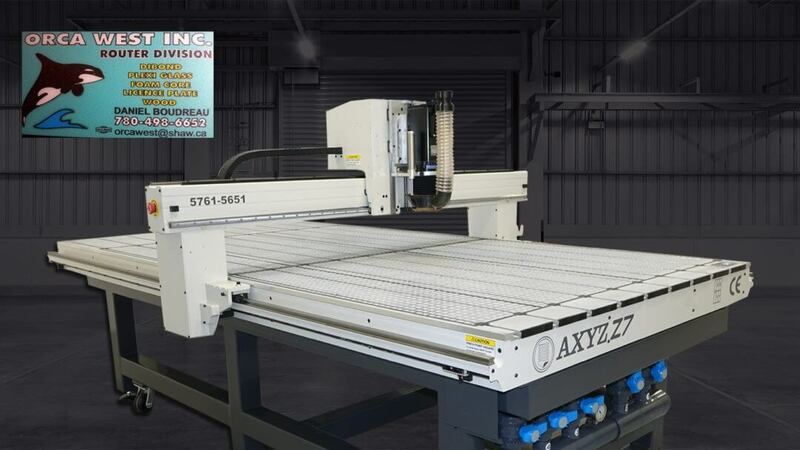 As trade began to rapidly increase they naturally turned to AXYZ, suppliers of high quality CNC routing systems for a solution and purchased a Camtech Z7 machine in 2008. Built and delivered by AXYZ, the Camtech Z7 is their entry level machine engineered to the usual high standards but with a budget conscious set of configurations. It is a multi-purpose routing machine, designed for cutting all types of plastics, woods, foams and metals in both 2D and 3D, which makes it ideal for signmakers. The Z7 is available with a standard process area of 54” x 104”, designed for efficient use of material sizes as well as a high performance to price ratio. With features that you find on much higher priced machines including welded steel frame, profile linear bearing rails, and a multi-purpose aluminum vacuum and clamping deck, the Z7 is hard to beat. Dan purchased the Camtech because he was tired of waiting on other companies to cut his designs and was always surprised at the high price he was charged for the privilege. He is pleased to announce he can now turn that same job around in just days instead of weeks! Reducing the lead times means reduced costs and that can only lead to more happy customers.